A donation was made to the Princess Margaret Hospital Burns Unit for a project to assist in retaining nurses in the unit, named as a tribute to the Spies Family. Brett, Ben and Georgie Spies tragically died following an horrific blaze at Timbertop Caravan Park in Mandurah on May 4 2011. Brett was a past member of the Rotary Club of Mandurah City and all three were members of the Mandurah Centrals Junior Football Club. The three Mandurah Rotary clubs and the Mandurah Centrals Junior Football Club jointly participated in a major public fundraising campaign to pay for the funerals. There was actually over $10,000 left over from this fundraising campaign, after paying all funeral expenses, and it will be presented to Tania McWilliams, Clinical Nursing Consultant of the Princess Margaret Hospital Burns Unit at the meeting on 20 February. Additional funds remaining from another Rotary appeal to help a young burns victim from Bali was added in to give a total donation of $14,000 to the PMH burns unit. At the joint meeting of the three Mandurah Rotary Clubs at RAAFA Meadow Springs on Wednesday 20 February with 66 Rotarians and guests attending, Assistant Governor Frank Wheel explained the background to the funds and the Spies and Dhani appeals, Tania McWilliams talked about the "Spies Family Burns Nursing Retention Programme", which is where this money is going. 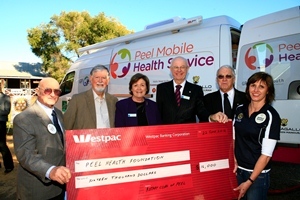 District Governor Bob Cooper presented the cheque for $14,000 on behalf of the three Mandurah Rotary Clubs and the Mandurah Centrals Junior Football Club. Denys Pearce, Chief Executive Officer of the Princess Margaret Hospital Foundation received the cheques and gave a brief talk about the PMF Foundation and thanked everyone for their contribution. Others involved in the appeal were Tony Free of Mandurah Centrals Junior Football Club and the Presidents of the three Mandurah Rotary Clubs, Colin Gilbert (Mandurah City RC), Michelle Pritchard (Mandurah RC), and Phil Brown (Mandurah Districts RC).